RALEIGH, N.C. – Clemson coach Dabo Swinney isn’t changing how the Tigers approach each season – and there’s no reason he should. The repetition is working. His program is the unquestioned Atlantic Coast Conference favorite again and has become a perennial national power. Everyone else in the ACC is looking up at the three-time reigning champions and trying to figure out a way to loosen their grip on the league. The Tigers are the overwhelming favorite to win the ACC for a fourth straight season, which would make Clemson the first ACC team to win four straight since Florida State’s dominating romp through the 1990s. That would also make Clemson only the second power-conference team to win four straight league championship games. Over the past three years, the Tigers are 25-2 against league teams, with 18 wins by double-digit margins and the losses coming by a combined four points. They are returning seven offensive starters and eight on defense, including first-team all-ACC performers in offensive tackle Mitch Hyatt, defensive ends Clelin Ferrell and Christian Wilkins, and defensive tackle Dexter Lawrence. The biggest question around Clemson is whether quarterback Kelly Bryant keeps his job after guiding the Tigers to the College Football Playoff or if Swinney will switch to freshman Trevor Lawrence at some point during the year. As for the rest of the league, there continues to be an imbalance of power that has the Clemson-led Atlantic Division looking significantly stronger than the Coastal. But the Atlantic has plenty of change with Florida State bringing in new coach Willie Taggart, Louisville replacing former Heisman Trophy winner Lamar Jackson and North Carolina State overhauling its defense. They all have the same goal. Atlantic: Clemson. There isn’t another team in the country – much less the division – that can match what Clemson has accomplished outside of reigning national champion Alabama. Coastal: Miami. The Hurricanes were the first preseason division favorite to actually finish in first by the end of the year since Virginia Tech did it in 2011. That was also the last Coastal team to repeat as division winner, so Mark Richt’s Hurricanes are trying to hold onto their perch in a division that frequently features the unexpected and could see several teams convert experience into defensive improvement . AJ Dillon, Boston College. Last year’s ACC rookie of the year is this season’s preseason player of the year after running for 1,569 yards and 14 touchdowns. Ryan Finley, North Carolina State. Finley returned to school for his final season after flirting with entering the NFL draft in the offseason. He completed 65 percent of his passes last year and has three experienced wideouts in 1,000-yard receiver Kelvin Harmon, Jakobi Meyers and Stephen Louis. Cam Akers, Florida State. The sophomore running back ran for 1,024 yards and seven touchdowns last season. Clemson’s defensive line. Wilkins, Lawrence and Ferrell are all top-tier NFL draft prospects. That could make for some long Saturday afternoons for offensive lines in the Atlantic Division. TaQuon Marshall, Georgia Tech. The Yellow Jackets’ quarterback ran for 1,146 yards and 17 touchdowns to go with 10 touchdowns passing in Paul Johnson’s run-heavy attack. Jaylen Smith, Louisville. The senior receiver is recovering from an emergency appendectomy, but is a preseason all-ACC pick who had 980 yards and seven touchdowns receiving in just 10 games last year. Taggart spent a season at Oregon before coming to Florida State to replace Jimbo Fisher after he left for Texas A&M. He inherits a team with 10 returning starters on offense and defense after a bumpy 7-6 season. Three coaches have been in place at least a decade in the ACC. 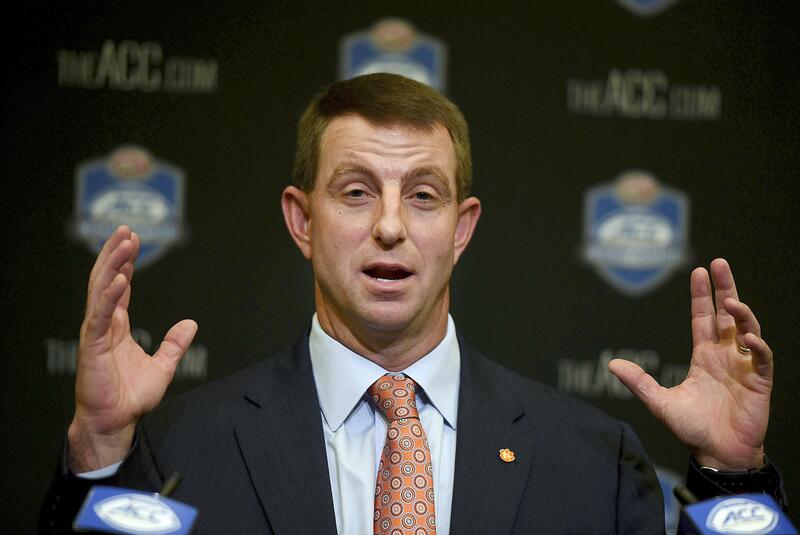 Clemson’s Swinney took over during the 2008 season and is entering his 10th full season. Duke’s David Cutcliffe and Georgia Tech’s Paul Johnson are in their 11th seasons after taking over their programs that same year. At North Carolina, 13 players will sit out games after committing NCAA secondary violations by selling team-issued shoes. That list includes quarterback Chazz Surratt – who was expected to compete for the starting job – returning starter Malik Carney at defensive end and another projected starter there in Tomon Fox. The suspensions could cut into the Tar Heels’ depth in the opening month as they try to regroup from a three-win season, the first serious stumble under seventh-year coach Larry Fedora. The league has a couple of marquee matchups in Week 1, two against the Southeastern Conference. Louisville plays Alabama in Orlando on Sept. 1, while Miami plays LSU in Arlington, Texas the next day. And on Labor Day, Taggart’s Seminoles face Virginia Tech in a conference matchup. Published: Aug. 14, 2018, 11:04 a.m.